Welcome back to the blog! Today I have another review for you in partnership with gunfire.com and this time we’ll be looking at the Specna Arms CORE BB range! 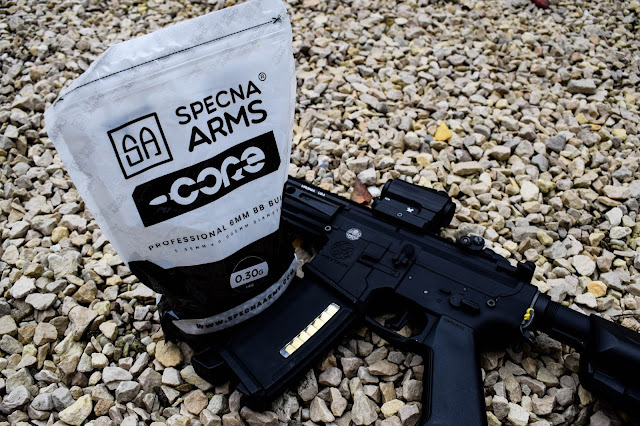 Those of you who read the blog often will have probably seen my reviews on the SA-G11, SA-C09 and the SA-H08 from Specna Arms and now it’s time to turn our focus to their line of ammo. Gunfire sent over a few 1 kg bags of their 0.30g BBs for me to test, as most indoor CQB sites have ammo weight limits I tested these in the outdoor games I’ve played over the last couple of months in both my custom Krytac MKII CRB and my G&G Armament Black Orchid ARP9. 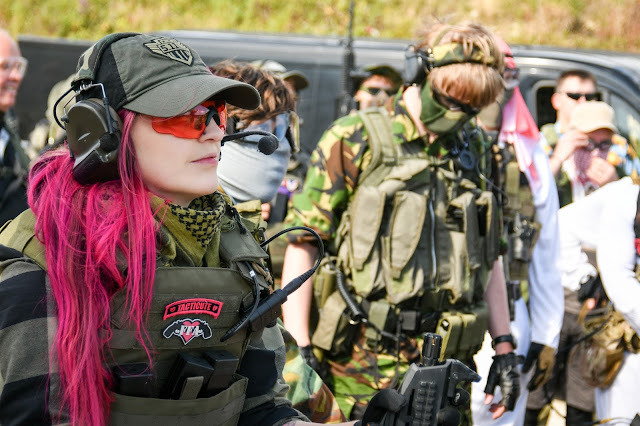 Whilst Specna Arms is, as a brand getting pretty well-known in the airsoft community thanks to their quality, well-priced replicas, their new BB line is still relatively new to players. Their mission is to give players excellent quality BBs that have a very good price to quantity ratio. 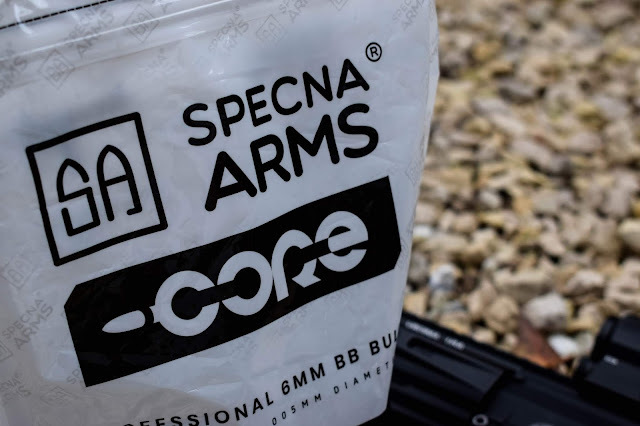 Although there’s not too much to say about the features of a BB, the diameter of the Specna Arms CORE™ BBs is 5.95 mm (+/- 0.005 mm) which is pretty standard along the board of BBs on the market and the difference in weight between each BB does not exceed 0.01g which is excellent. These combined means they’re an ideal choice of ammo for replicas with stock internal barrels and they can also be used in tuned replicas that are equipped with precision barrels. Each BB has a high-gloss polish which helps prevents issues with feeding from a variety of magazines and also helps achieve a stable spin on the BB by the Hop-Up system. 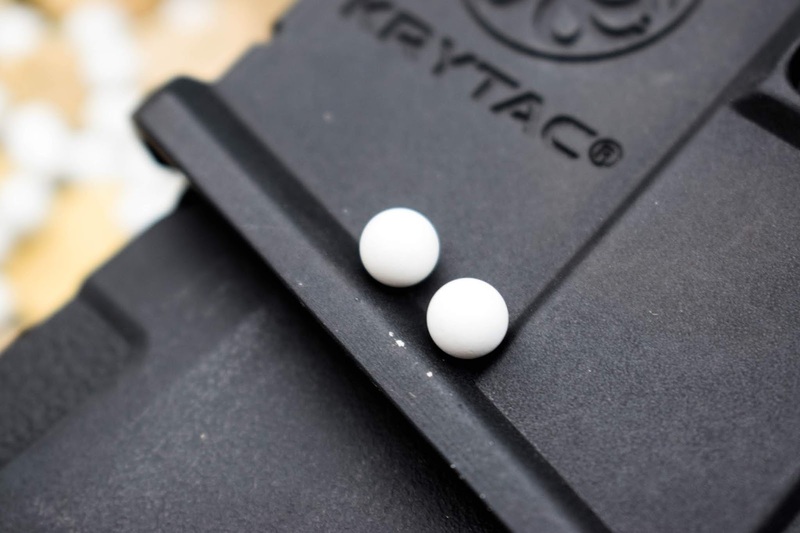 I tested the 0.30g Specna Arms CORE BBs in my upgraded Krytac MKII CRB with the PTS Syndicate Enhanced Polymer Magazines, after quickly adjusting the hop to help carry a heavier BB than I would usually use in this gun I was soon putting rounds down range. The only issue I had with using them in this rifle is, around the 12th magazine in, two of the BBs did get jammed in the barrel. I’ve not had this problem with this rifle/BBs since so whether it was a one-off or something to do with the custom internals I don’t know. It was easily solved with a jamming rod. I also tested them in my G&G Armament Black Orchid ARP9, which has completely stock internals. For this, I used the G&G ARP9 mid capacity magazines and again adjusted the hop. The BBs fed really well in this rifle and I had no misfeeds or jams. The Specna Arms CORE BB’s are available in various weights and quantities. From 0.20g BBs all the way up to 0.30g and available in bags of 0.5kg and 1kg bags. At the time of writing this review, only the 0.5kg bag of 0.30g BBs were available from the GF website and they were priced at £3.21, which is a seriously good price! Overall, I’m pretty happy with the quality of them. SMOKE THE RAINBOW | ENOLA GAYE NEW RELEASES! IN THE ARMOURY: TOKYO MARUI HK45! PTS ENHANCED POLYMER BACK UP IRONSIGHTS REVIEW!